Change that is highly disruptive and is leading toward an unknown future pays a price on us personally. The mental and emotional toll can ware us down physically. We sleep a few hours at night, then wake up and lie there thinking about what we should be doing or how to respond. If we aren’t getting enough sleep, we are not going to be sharp enough to think clearly. When we have a clear mind, our emotions are less troubled, and we can make better decisions and take more effective action to address the issues related to change. Here’s a little thinking process that we can use to find the peacefulness of a clear mind. I suggest that we use this not just for the big questions, but for every situation we encounter. After I describe it, you’ll understand. Download the Impact Leadership Conversation Guides to more easily follow along. Once we have acknowledged that we are at a point of change, we need to ask The Four Questions That Every Leader Must Ask. These questions guide us through a simple process of clarifying our thinking. 1. What is Our Impact? Impact is the difference something makes. Throw a stone into a pond, and we see the impact in terms of the ripples that radiate out from the center. Impact is the same. We can see the effect. It is a kind of change, too. When we look for the difference something has made, we are measuring impact. All ready, by recognizing that you are at a transition point, you are measuring impact. 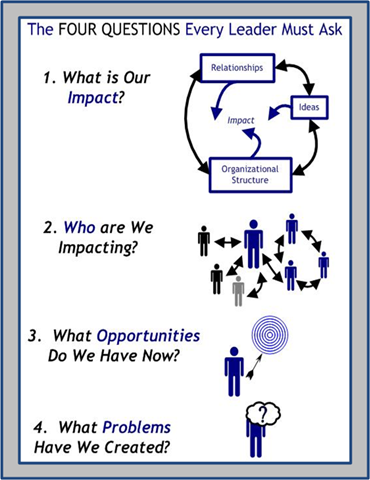 We need to be clear about the impact we are experiencing, so we ask the question in several ways. Over the past 18 months, what difference have we made? What has changed during this time? What difference have our ideas made, our communication, the articulation of our mission, values and vision? What difference have our relationships made? Do you know what you expect from your relationships with people? What has changed in your relationships? What difference has the structure of our organization made? An organizations structure functions in four areas: Governance, Program, Operations, and, Resources. What difference has each made? This form of questioning is focused on creating a current assessment of your situation. What if you are instead dealing with a real problem, you can also at the question in a problem solving mode. What is the impact of this problem? Is this an Ideas, Relationship or Structure problem? If may well be a combination of all of them. Or you can ask this question in planning for the future. What difference do we want to make in 18 months? What change should we be able to identify if we effective in our work? Asking the impact question in every situation clarifies your purpose and what you hope to achieve in a situation. Ask the question enough, and you’ll begin to think less in terms of doing repetitive activities and become more focused on impact. 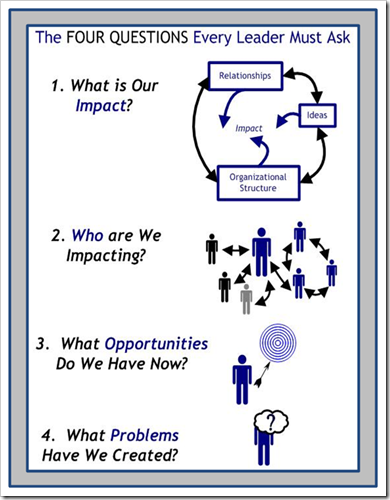 Once you are clear about the question of impact, ask the other three questions. 2. What Are We Impacting? This question clarifies the market or network of people who are most affected by what you do. Do you have a measure of the difference you should be making? If not, this process will help you begin to create it. 3. What Opportunities Do We Now Have? The emphasis of this question is on opportunities that we have right NOW! We are interested in possible opportunities. Those are only possible because of the ones we have right now. We need to act on these opportunities. And we need to prioritize them, too. How do you prioritize your opportunities? You simply ask what difference each one will make. If you have answered question #1 sufficiently, you should know where to start. It is not as simple as deciding which one has the most bang for the buck. Rather, we need to ask which ones carry us further toward long-term, sustainable impact? 4. What Problems Have We Created? The easiest thing to do when confronted with change is to play the victim card. We may be at a transition point because of external circumstances like the downturn in the economy. Feeling sorry for ourselves, and waiting for our external circumstance to change for the better is a plan for increasing decline. Instead, we need to look at what we do control that is limiting our ability to take advantage of our opportunities. The truth is that we are all in transition all the time. This isn’t a method for resolving an occasional problem situation that you might be in, but every situation. Print this post off, use it along with the Impact Leadership Guides and go to your next meeting with them. The transition you are in is whether that meeting will have any impact. You can become the person who makes the real difference in the meeting. Just try and see what happens. Achieving the peacefulness of a clear mind comes from taking care of yourself physically, emotionally and perceptually. Our emotions are tied to our perception of what is happening. If you are able to see the pathway to impact, they your emotions are not divided, but focused. As a result, you’ll sleep better at night. That is unless the impact you perceived is so great and fantastic that it keeps you up at night dreaming of great things to come in the future. If so, that is worth missing a little sleep over. Tagged with clarity, clear, four, governance, ideas, impact, mind, operations, organizations, peace, people, program, questions, relationships, resources, structure, transition.